Breakfast in Italy is called ‘prima colazione’, or simply ‘colazione’. It’s the first meal of the day and many say it’s the most important one too. However, North Americans and Italians have fundamental differences of opinions in what to eat for breakfast. The first main difference is that savory breakfast items are almost absent in most parts of Italy. You would never see an Italian eating bacon and eggs, or even a bagel, which is standard in North America – and these items don’t appear on restaurant menus either. Things are quite different on the sweet side as well: no cereals, no peanut butter, no pancakes, no waffles or scones. What do Italians eat for breakfast then? ‘Biscotti’ (generic name for cookies, but more like the Italian version of cereal), typically ‘frollini’ (butter shortbreads), usually dipped in the caffè latte. Hot chocolate or plain black tea (with milk or lemon) is sometimes an alternative to coffee. Other options that are generally reserved for young children include milk with barley or malt coffee substitutes, or milk with cocoa powder. Italians follow more rules in general as to when to eat what. A cappuccino, for instance, is a morning treat, it’s OK in the afternoon as an alternative to espresso during coffee breaks, but it’s definitely not a replacement for the after-dinner espresso. Everything has a purpose, and the espresso after a meal is meant to be one last strong punch of flavor – the delicate nuances of a cappuccino would be out of place, and the milk would be heavy on a full stomach. In Italy, a small selection of cereals with milk or yogurt cater to the diet-conscious, but aren’t very common. Fruit juices are quite popular, especially pear, apricot, peach and apple. With the exception of citrus, Italian style juices are generally thicker compared to their North American equivalents, are also sold in individual glass bottles (20 ml), and sometimes considered a complete meal. Fresh squeezed orange juice is also well liked, especially during winter. As you can see, sweet things are the preference. This is the case almost everywhere in Italy, with the Alto Adige region being the most notable exception. In Alto Adige, also called Südtirol, the Austrian influence can clearly be seen in the tradition of having cheese, ham and eggs for breakfast. A somewhat limited savory presence can also be found in hotels. Italian hotels generally just offer an expanded version of a home breakfast, but with the possible addition of a sample of cold cuts and cheese, in line with what is internationally known as Continental Breakfast. A truly Italian routine, however, is to go have breakfast in what Italians call a “bar”. These have very little in common with North American bars. Italian bars are essentially licensed coffee shops that typically serve espresso all day, breakfast in the morning, sandwiches and beer around lunch time, appetizers (called ‘aperitivi’) and long drinks near dinner, and are usually closed in the evening. Bars are extremely popular in Italy – in the big cities you can find them at every corner, and they are all different from one another being usually privately owned (there are no major chains). Bars’ consistent quality, contained prices, and prompt service make them the preferred choice for people who commute to work or to school – it takes less time to get breakfast in a bar than it does to have it at home, and most Italians would also find it more satisfying. Prompt service however comes with a caveat. The busier the place, the more you should know what you want to order before you go in – you don’t want a “no cappuccino for you!” reaction from the bartender. Cash payment is also much preferred because of its speed. Then, after you get served, you are supposed to step aside and consume your breakfast quickly, trying not to exasperate the server and patrons behind you (the fact that it is your turn to be served doesn’t buy you all the time that you want to choose your pastry or dawdle in the bar). Most bars even encourage a quick turnover by having high tables and no sit down service. You can read more on the Italian Bar in this article. Bar-style breakfast consists almost exclusively of what the Italians call ‘cappuccino’ and ‘brioche’. We’ve already talked about cappuccino, and its alternatives such as ‘latte macchiato’ (with more milk), coffee ‘macchiato’ (with less milk), or just plain espresso (with no milk at all). By “brioche”, Italians actually mean any kind of baked good, the most common of which is in fact a croissant (‘cornetto’ in Italian) and almost never an actual brioche. A croissant can be “empty” (‘vuoto’), or filled (e.g. with ‘crema pasticcera’ -pastry cream-, apricot jam, chocolate cream, whipped cream, apple filling, almond filling, etc.). Other breakfast pastries which are also usually filled are: ‘fagottino’ (the equivalent of the French ‘pain au chocolat‘, when filled with chocolate), ‘sfogliatina’ (puff pastry pockets), ‘bombolone’ (also called with its German name ‘krapfen‘, the equivalent of a filled donut), ‘girelle’ (twirls) with raisins. Savory croissants, with optional ham and/or cheese, can also be found, but are definitely far less in vogue than the sweet versions. Other savory options are ‘pizzette’ (small puff pastry pizzas, usually with tomato and mozzarella), but are quite hard to find. In Italy, the maximum price of the main bar menu items is regulated by the law. This makes it so all bars tend to charge the same maximum amounts allowed. While not competing on prices, bars still compete on quality. Pastry shops that are also cafés (called ‘bar pasticceria’) generally offer higher standards for baked goods, compared to regular ‘bars’; this is especially true in small towns. In big cities the bars with the higher customers turnover often get their pastries delivered fresh from pastry shops even multiple times a day and the quality of their baked goods is excellent. Smaller bars instead often bake their croissants themselves (from an industrially made base), and while smelling fantastic because of the onsite baking their croissants are not as good (and sometimes are thought of as more buttery and harder to digest). Still, smaller bars make good business in small towns where the competition is less, still providing a service to their customers. In conclusion, breakfast is for the Italians a brief yet dear parenthesis in the morning. Even on weekends and holidays people generally don’t go out for sit down breakfasts. 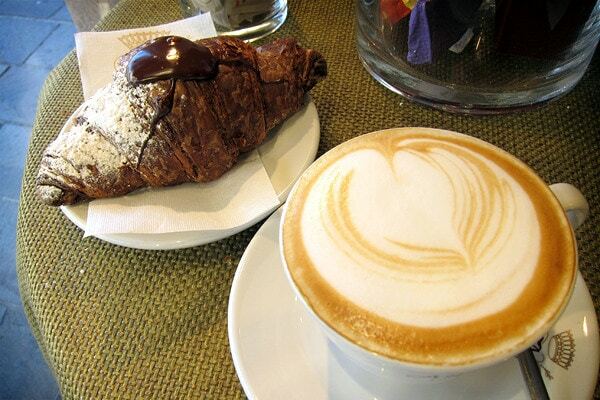 In fact, there are no ‘all day breakfast’ places in Italy (though it’s definitely possible to have a cappuccino all day, it’s uncommon to see people have a croissant in the afternoon, so much so that bars tend to run out of pastries early and don’t replenish). As a result, breakfast in Italy is not necessarily a moment of social aggregation; it’s at most a meet-up point for 2 or 3 individuals. The lack of savory options in the Italian breakfast also originates other interesting differences between Italy and North America. One difference is that for the Italians eggs are totally a lunch option (as the main or the second course). Another difference is that in Italy there is absolutely nothing like North American brunch; being the Italian breakfast so different from lunch, the two don’t mix: after sleeping in on weekends Italians may just decide to skip breakfast altogether and have their Sunday’s lasagna! now i am craving a perfect espresso and a cornetto filled with crema 'al gianduia'.. I don't know why american and british people eat sausages, bacon (bleah), eggs for breakfast… for me it's impossible to eat savory dishes for breakfast. We need something sweet in the morning right after wake up… and we don't want to spend time to cook right after wake up.